Following up last week's blog post, I figured I'd share some more snow-covered fun. Dani and Kamran and I met up on a snowy day in January. 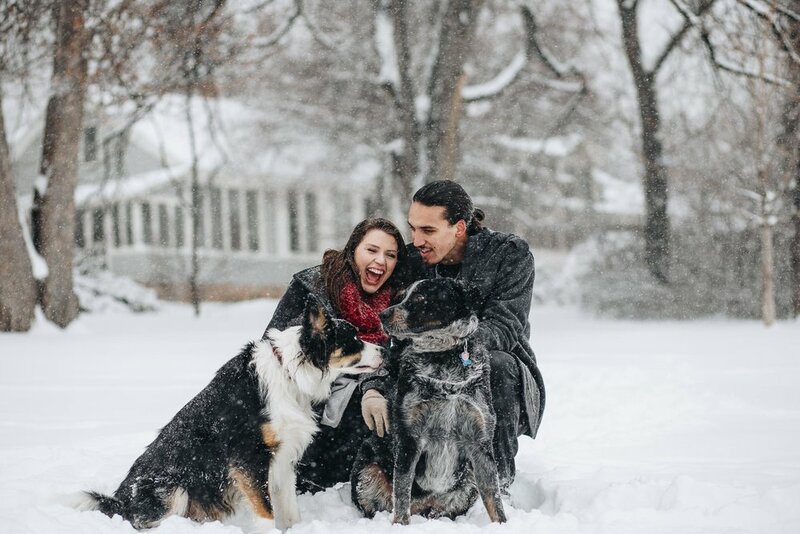 We'd originally scheduled the engagement shoot at an earlier date, but the two of them were set on having at least some snow in their photos. So, we rescheduled for a Sunday. I warned them that my weekends around that Sunday were not available with weddings and various things I had going on, so this would be our last chance to shoot, no matter what the weather delivered. WELL. That Sunday delivered snow. It delivered blizzard and white-as-far-as-the-eye-can-see-style snow. It delivered not only covered-in-snow, but soaked-through-in-snow. These two were troopers. They looked happy as pie in every picture because they were happy as pie, despite the wet and cold. On my end, I had a blast. Not only was it fun frolicking around in the snow, but the pictures came out so splendidly with the gorgeous colors they chose against the stark white backdrop. Now this is a fearless love! Thanks for playing in the snow with me, Dani and Kamran! I would do it again in a heartbeat. PS - Click images to enlarge and see them in all their glory!